KIEV, Ukraine -- The Irony of Fate is watched on TV by millions of families each year but could be banned because one of its actors backed Russia’s annexation of Crimea. 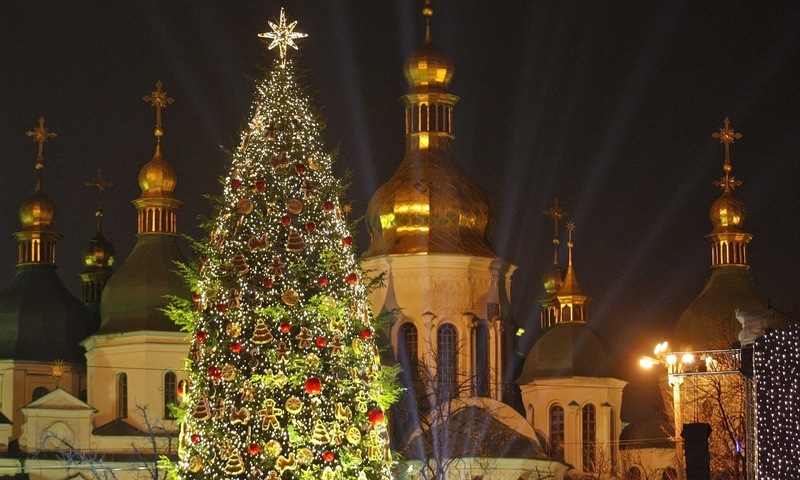 A Christmas tree in Kiev. The probable ban of a popular Soviet film in Ukraine has caused alarm among those who like to watch it annually during the festive period. The Irony of Fate, released in 1976 and set on New Year’s Eve, has become a holiday tradition in Russia and other post-Soviet countries, where it is shown on television and watched by millions of families each year. The film is in danger of being banned in Ukraine because one of the actors who provided a voiceover for the film was put on a list of cultural figures who pose a threat to national security because of her support for Russia’s annexation of Crimea. However, the film’s director, Eldar Ryazov, who died this year, was an outspoken critic of the Russian government’s recent actions. The Ukrainian government, which came to power after the Maidan revolution last year, has moved to limit Russian influence in the country, especially after the annexation of Crimea and Russian military intervention in the east. But critics say the moves have gone too far when it comes to banning films. The Irony of Fate follows a group of friends who get drunk at a sauna on New Year’s Eve, toasting Zhenya, who is soon to marry his fiancee. The group travel to the airport and, in a stupor, they put the passed-out Zhenya on a plane to Leningrad instead of his friend. When Zhenya awakes he thinks he is still in Moscow, and takes a taxi to his home address. In a commentary on the uniformity of Soviet urban planning, there is a street with the same name and an identikit block of flats, and when he arrives even the furniture looks the same. When the flat’s real resident, Nadya, returns, she is horrified to find a drunk man in her apartment, but after many false starts love eventually blossoms between the pair. Ukraine’s ministry of culture has drawn up a long list of actors who apparently threaten the national security of the country because of their political positions, including Gerard Depardieu, the French actor who has taken Russian citizenship. Depardieu and other actors on the list were banned from entering Ukraine, and new films involving them will not receive licences to be shown in the country. However, the law is ambiguous on whether old films that already have licences can be shown. In the run-up to the new year period, it has been pointed out that The Irony of Fate is likely to fall victim to the ban, although there has been no official announcement. The Opposition Bloc, a political group based on the remnants of the former president Viktor Yanukovych’s Party of Regions, which has strong support in the Russian-speaking east of the country, said it planned to contest the ban in court. On Thursday the Ukrainian parliament announced that sanctions against Russia would come into force on 1 January, in response to Russia’s cancelling of a free trade agreement. Russia says it can no longer allow free trade with Kiev after a trade agreement between Ukraine and the EU takes effect.